Gosh life has been busy over the last few months ! Lots of happy events and one sad one. We had a meeting of our writers’ club at our place – Judy produced some wonderful food and everyone seemed to enjoy themselves, oh and we did talk about writing a bit. In the following month we met up again at our American member’s Chateau – of course we aren’t snobs! We have been to several of the “pie nights” run by the farming couple we get our bacon from. Very enjoyable to sit outside a bar in an officially beautiful French village and eat steak and kidney pies with chips, HP sauce and a glass of wine. They are featured in the ITV series “Little England” which is pretty awful and patronising. 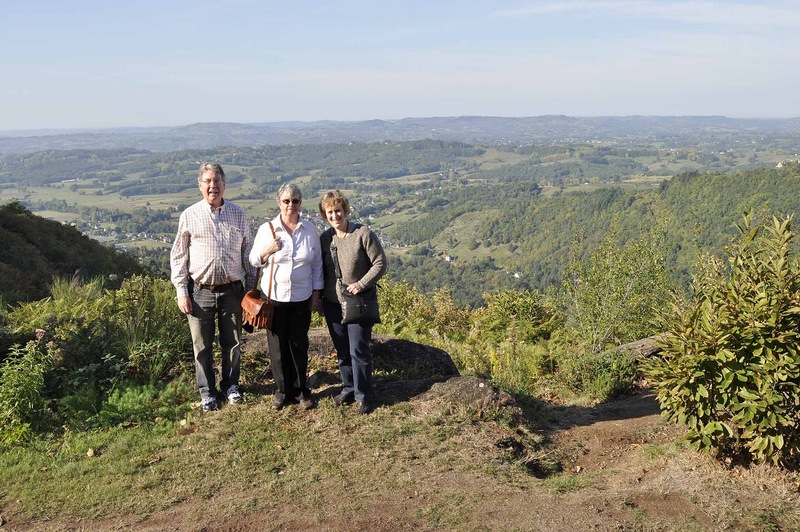 It is supposed to be all about the Dordogne – but Sophie and Ray live and work here in the Correze. Can’t you trust anything on TV? The weather started off a bit wet and gloomy, but in the last couple of months it has been mostly really good, with temperatures on average in the high 20s. There has been a bit of rain (needed for the farmers of course), just a shame one of the very wet days had to be when we had visitors. 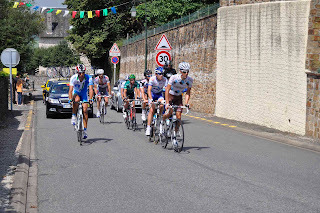 Talking of visitors we have three lots of visitors and met with another three lots in various parts of France. First we met the Allnutts in Sarlat – lovely lunch but make note to self that Sarlat is really busy in the summer. 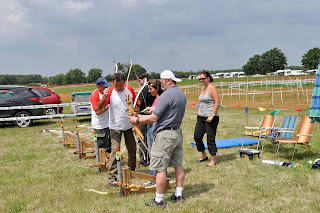 Then we got together with the Wallaces – I flew with Martin on Hercules, and his French wife comes from a couple of hours North of us. 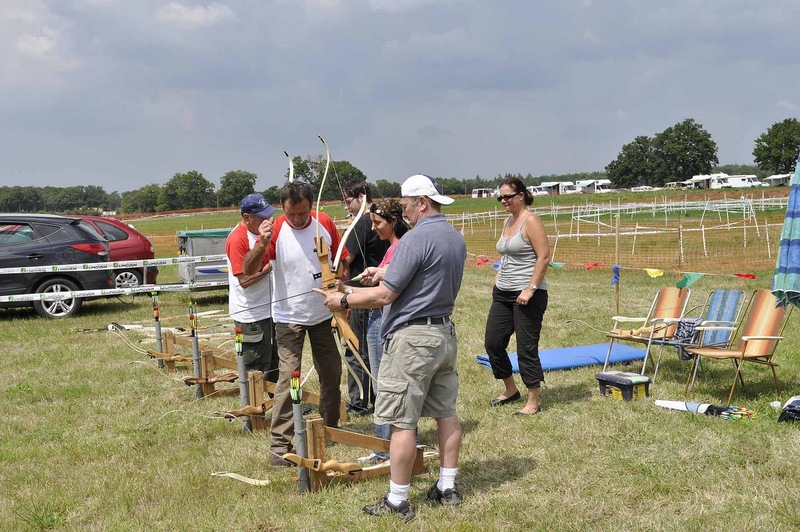 We met at a microlight and balloon festival near them – sadly there wasn’t much flying going on, but we all had a good time at the archery demonstration. 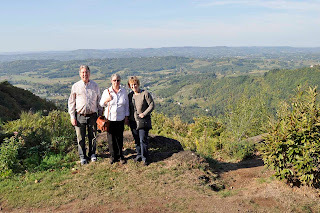 Final lot of friends we met up with were the Makepeaces – they had taken a Gite in the Creuse (an adjoining department to the Correze) with friends and family for Dave’s 60th (he’s so old – over a month older than me!). 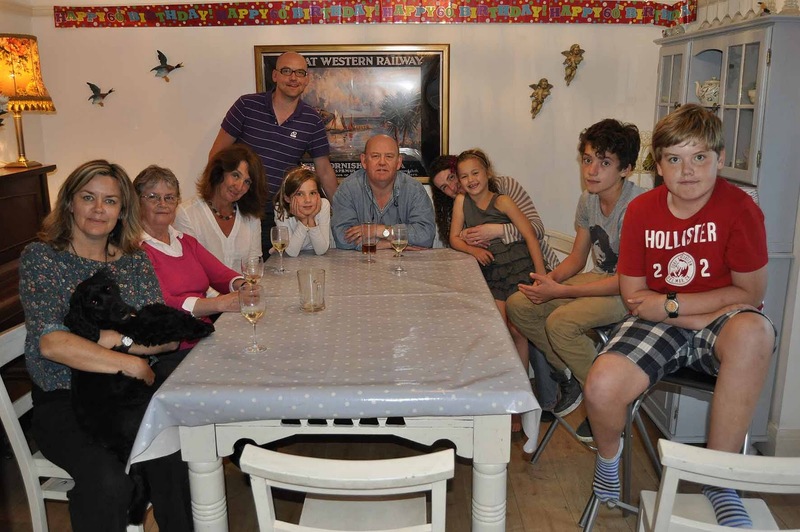 We were invited to a very enjoyable birthday party, and even our dogs behaved themselves. 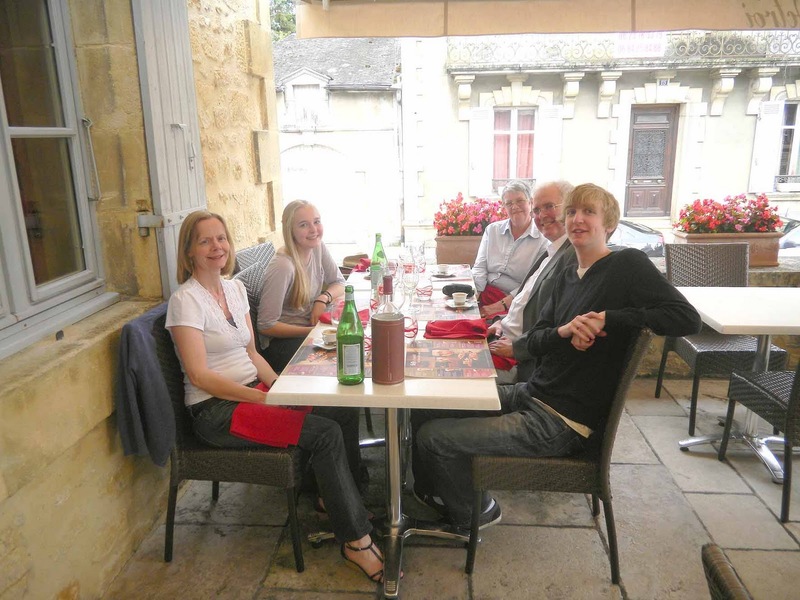 Three lots of visitors have stayed with us – the Lockies, Ashforth-Smiths and Harrops. 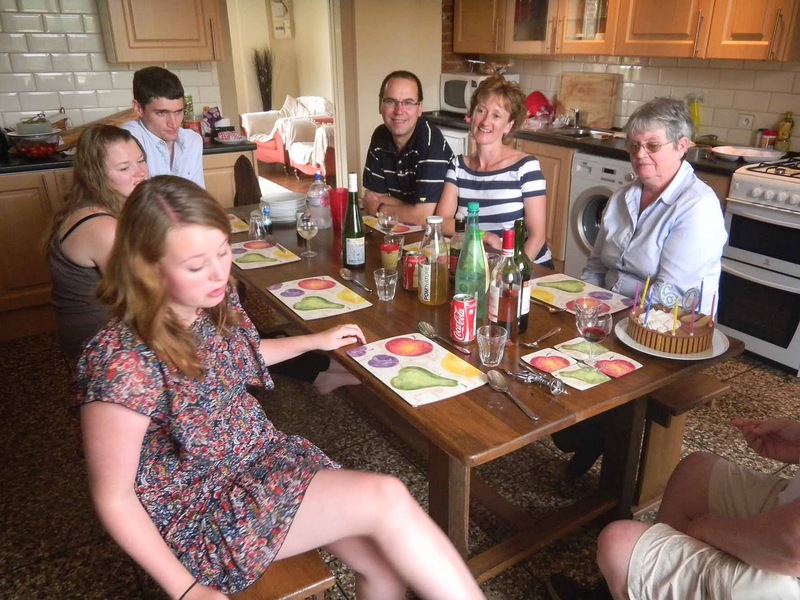 They all seem to have enjoyed themselves and Judy’s cooking rose to even greater heights! 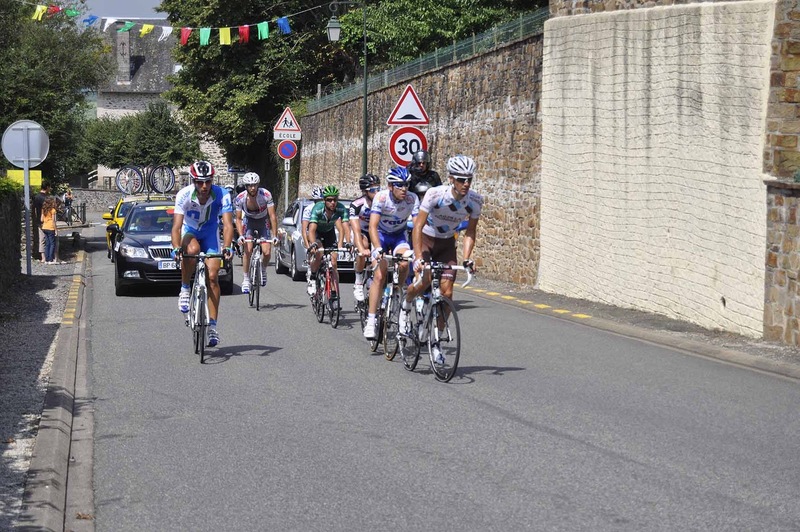 Locally we had the Paris-Correze cycle race whizz through the village, not exactly the Tour de France, but they all took it very seriously. The local historic town of Donzenac had a Mediaeval Street Fair on a lovely sunny summer afternoon. We took Faust as we thought he looks suitably period, and he was much admired. 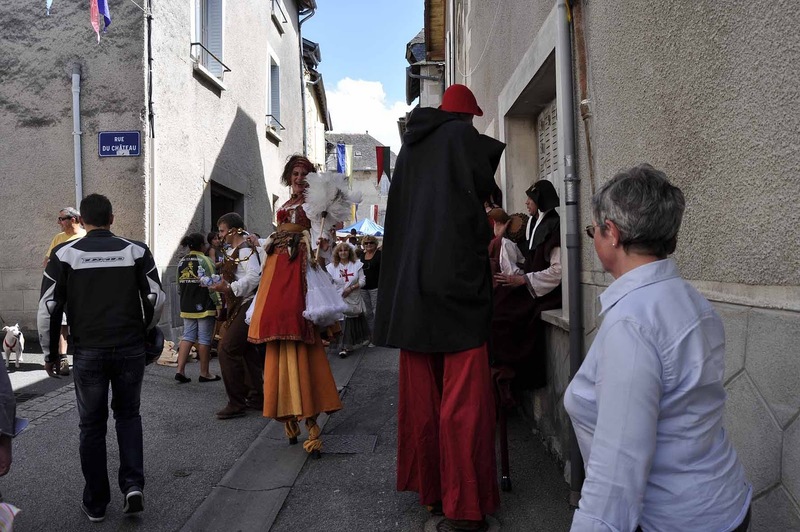 However mediaeval towns have narrow mediaeval streets, and filled with crowds, people playing drums and stilt-walking, it wasn’t really a suitable place for enormous dogs, although he behaved perfectly. Judy and I were looking for something else to do out here – as if daytime TV is not absorbing enough! We have joined SSAFA (the Soldiers, Sailors, Airmen and Families Association), which has a branch covering France. I will be a case-worker and Judy a visitor, trying to help people with military connections, who have money or other problems. With the collapse of the pound against the Euro, many who moved here relying on pensions have seen their income drop drastically in the last few years. As you may have surmised from above, I too was 60 a few weeks ago. My lovely children planned a party for me on the day, so Judy and I arranged to fly to England and have a few days seeing friends and family. Very sadly just before we left we learned that Judy’s brother-in-law Peter (married to her older sister Carol) had died after a long illness. 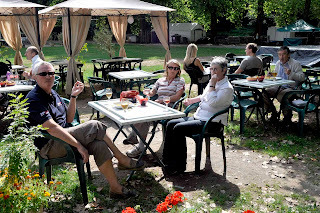 The funeral was a few days after we had intended to return to France, but we were able to rebook our flight home, and extend kennels and car hire. We were able to visit (and stay) with a number of friends, and special thanks are very much due to Rennie and Peter, Posy and Romney – all great hosts. We stayed in Essex (twice), Gloucestershire, Dorset and Oxfordshire, and caught up with a few old friends on the way. My birthday party was enormous fun and again thanks to Nick and Lisa and Rachel, Jake and Esme, Martin, Vicky, Tom and Flora. Thanks for all the presents too – we actually had to buy another suitcase! Peter’s funeral was obviously a very sorrowful occasion, but it was nice that Carol’s family were able to attend – including a sister from Saudi Arabia and daughters from California and Vancouver. As I am sure he would have wanted, we tried to celebrate his life rather than just mourn his passing. 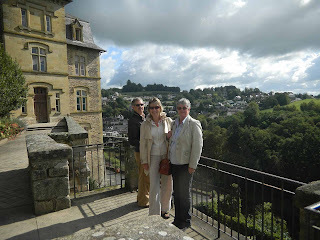 Back in France we had our latest lot of visitors the day after we got home, then I had two business jobs and we attended a party at Brive Rugby Club thrown by the Franco British Chamber of Commerce. No visitors for a few weeks, although I have to go to London for a few days in a couple of weeks to do a course with SSAFA. And we came here for the peace and quiet !